The betsy shrug is a loose fitting shrug or bolero with size instructions for small, medium and large. It is made in a dk weight yarn in a simple ‘V’ stitch pattern. It is worked in the round from cuff to centre back and then both sleeves are joined together with a cute ‘kiss stitch’ detail. 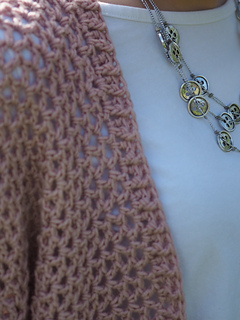 The pattern works up quite quickly and this easy to wear shrug is a versatile day-to-night item. Either dress down with jeans and a simple white tee, or glam it up over a cute black evening dress - made in a sparkly yarn it would look fabulous! The pattern is written in UK crochet terminology and does contain a US conversion chart.